Colorado's quintessential tree is the beautiful aspen. We've named towns, streets, dogs — even beer — after this glorious tree. In the summer, the aspens provide shade for our state flower, the columbine, and in the fall, Coloradans rejoice when the aspens' quaking leaves turn their vibrant shades of gold. Colorado offers a few unique ways to explore its fall colors. Ballooning in Colorado provides new perspectives on the state’s ubiquitous granite pinnacles, rocky spires and the tawny-hues of fall aspens. When you find yourself in a thatched basket, hundreds of feet up in the crisp Colorado air, the colors unfold below in a seemingly unending canvas of yellow and gold. The landscape becomes increasingly intriguing and inspiring while drifting from this high altitude angle. Find Colorado hot-air balloon companies. Few activities embody the West like an old-fashioned horseback ride through Colorado. Somehow, aspen viewing, wildlife watching, sightseeing and simply enjoying the outdoors are a different experience when sitting astride a saddle. Consider a trail for the day or book a vacation at a Colorado dude ranch. 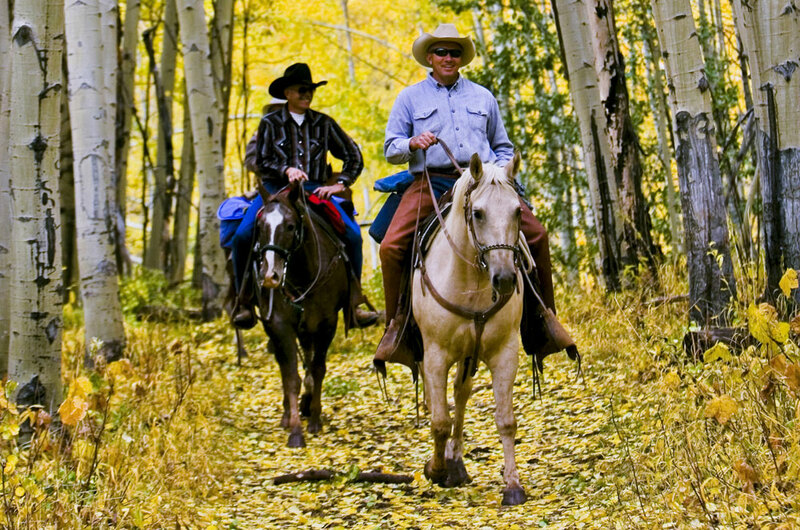 Find Colorado horseback riding options. Travel deep into aspen-covered backcountry while riding a mountain bike, four-wheeler, ATV or 4x4 vehicle. Forest trails, often explored by just a handful of visitors, abound in Colorado. Find yourself surrounded by speckled aspen bark, as a golden canopy of color rises above you. Find Colorado ATV rentals and 7 Popular ATV & Jeep Trails. Colorado's 26 scenic and historic byways pass through some of the state's most scenic areas and are a great way to find fall color. Here are five best Colorado fall drives.